A quick drawing of a Together Alone character. I just wanted to get her design drawn out while still fresh in my mind. I'll move this to scraps when I can give her the attention of a fuller pic. 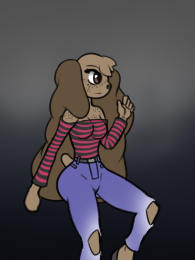 Autumn is decently athletic, a mid-level fighter and has the ability of limited extrasensory vision. When she is allowed to concentrate she can basically make an intangible, invisible, floating mental eyeball. As of just yet the range is very limited. A room, maybe two, and only a few seconds. The toll it takes is a little like an isometric workout. Which also means she could extend the time her ability is used if she trains daily. She gained her ability during ████████ █████ ████ ███████ ██ █████ ███████ in which an attempt to use her ███ ██ █ ████ ██ ██████ ███████. However, ██ ███████ ███ ███████ and she survived. She's quite cute. Can't wait until you can get around to her again. Thanks! She's really fun to draw~ I'm sure she'll be on my brain for a while, making sure I get her a full pic.